What does it take to win the best-of-show award for baked goods at a county fair? Well, if you're Angelina Gonzalez, an alumnus of the Sherwood Forest 4-H Club, Vallejo, and now the Solano County's 4-H SET (Science, Engineering and Technology) Program representative, sometimes practice makes perfect, and sometimes perfect doesn't need practice. 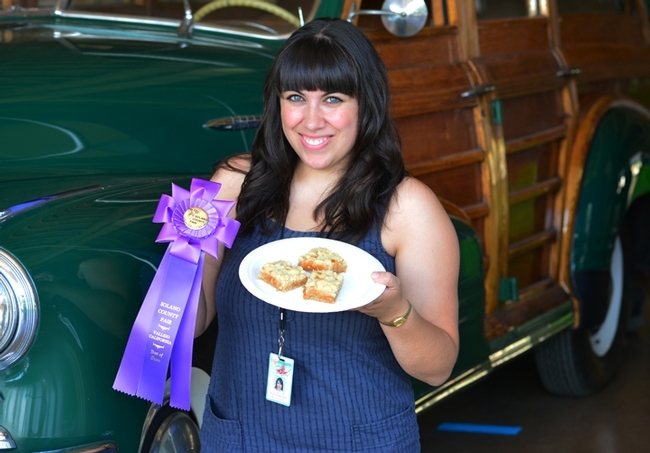 Gonzalez's salted caramel butter bars swept all five awards in the adult baked goods section of the 2014 Solano County Fair. Judges first awarded the bars a blue ribbon, and then best-of-division, followed by the sweepstakes award and the coveted best-of-show. "I've been entering cookies in the adult baked foods department for the past few years and have done well in the past," Gonzalez said. "I love baking and cookies are my specialty. This year, I attempted a recipe that I had never made before. It was a bit of a risk, but I wanted to try something new rather than another cookie recipe. I'm glad I did." 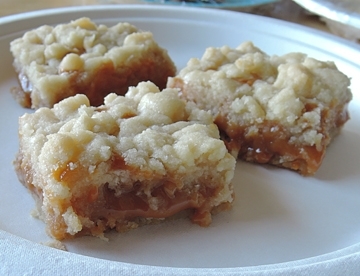 Gonzalez acknowledged it is not "the healthiest recipe out there (with a pound of butter and 50 caramel candies)," but the judges pronounced it absolutely delicious, the kind of bar cookie that folks would go back for seconds or thirds. "Although I never took a 4-H food project, I am thankful to 4-H for everything that I have learned through it," Gonzalez said. "I started 4-H when I was nine years old and quickly learned that I loved it. The following years, I became an active member our Sherwood Forest 4-H Club as historian, treasurer, vice president, and president." She enrolled in many different projects, including arts and crafts, ceramics, rabbits, dogs, dairy goats, horses, and leadership, receiving multiple awards at fairs. Among them: first place in novice and senior showmanship and various best-of-show awards and outstanding 4-H exhibitor awards. "I would definitely say that 4-H gave me confidence and life skills for the future," said Gonzalez, who holds a master's degree in sociology from Sacramento State University. "After aging out of the program and a year off, I came back to 4-H (Sherwood Forest 4-H Club) as an arts and crafts project leader." She just completed her seventh year as a project leader. Her work is much appreciated; she recently received the Solano County 4-H Alumni Award. "I love 4-H and look forward to where it takes me next," she said. 4-H'ers celebrate National 4-H Week every October. Youths and adult volunteers who want to sign up for the youth development program should contact their county 4-H program or the statewide office for more information. Here's the prize-winning recipe, not only perfect for the holidays but for any occasion. Bake crust until firm and the edges are a pale golden brown approximately 20 minutes. Transfer pan to a wire rack and let cool about 15 minutes. Once the caramel is melted, add in your 1/2 teaspoon vanilla and stir until combined. Pour the caramel filling over the crust. If you are going to salt the caramel, sprinkle it on caramel layer now. Next step? Enjoy! P.S. : There will be no leftovers. 4-H: Cows 'n chickens and . . . chili, too! 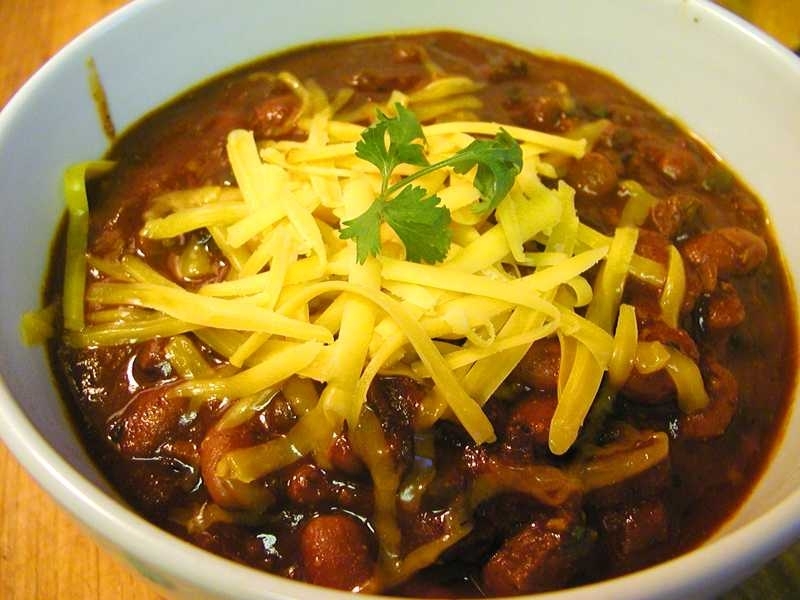 Well, sometimes (tongue in cheek), it’s also about chili! 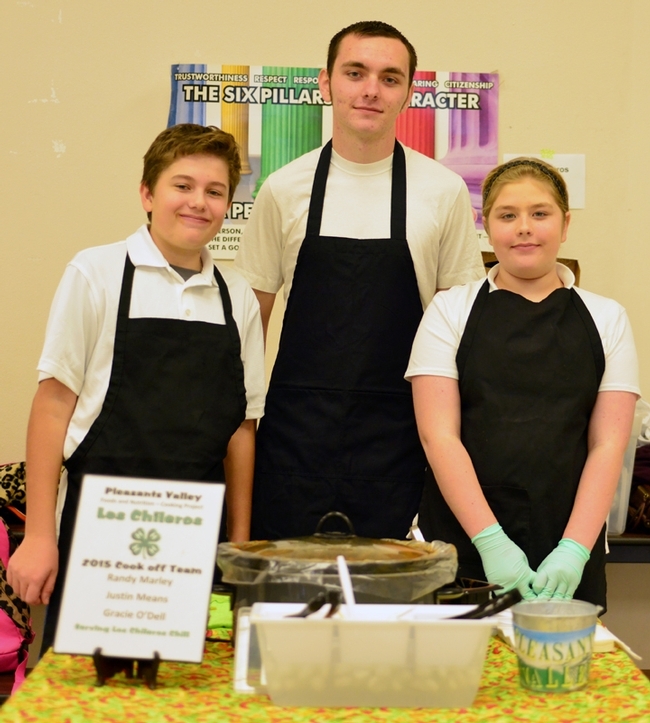 Every year since 2005, the Solano County 4-H Youth Development Program has sponsored a Chili Cookoff Contest as part of its Project Skills Day, where the youths share what they’ve learned in their projects. The scores of projects generally fall under the wide umbrellas of animal sciences, biological sciences, civic engagement, communication and expressive arts, community and volunteer service, environmental education and earth sciences, health, leadership and personal development, personal safety, physical sciences, plant sciences, shooting sports, and technology and engineering. True, 4-H projects do encompass cows ‘n chickens, but topics also include other “c’s” such as computer science, citizenship, cultural arts, camping, child development and care, career exploration, cardiopulmonary resuscitation (CPR), cake decorating and crocheting. Here’s how the Solano County 4-H Chili Cookoff works: The 4-H'ers (usually enrolled in food and nutrition projects) love chili! 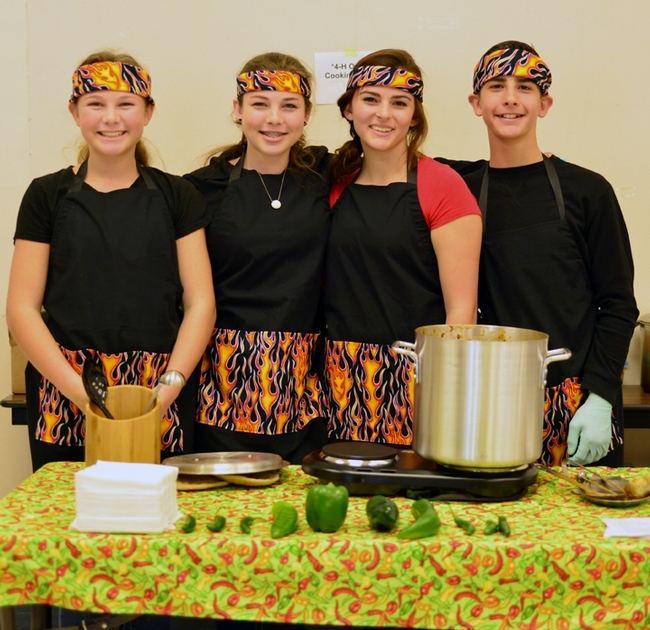 They form a team, create or embellish a chili recipe, and prepare the dish. Judges sample the finished products, quiz the cooks, and score the dishes on temperature, aroma, flavor, texture, freshness and overall presentation. In the past, the main ingredients have ranged from beef, pork, chicken, turkey and elk to strictly vegetarian. Unusual ingredients have included sweet potatoes, chile-laced mangoes, semi-sweet chocolate morsels, pineapple, coffee, beer, wine, peanut butter and bananas. 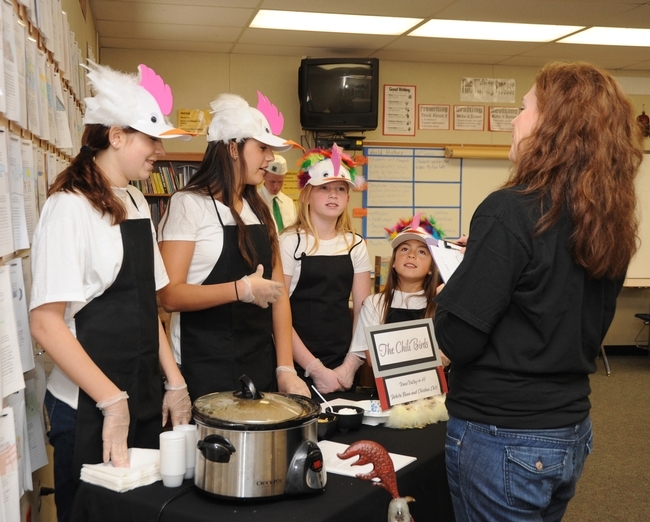 At this year’s Chili Cookoff, the winning team of Courtney Curtis, Toni DeTomasi, Halie Pringle, and Emma Couvillion of the Vaca Valley 4-H Club, Vacaville, came up with a chicken-chili recipe that wowed the judges. “It was a great chicken chili recipe,” said judge Heidi Johnson of Dixon, one of three adults judging the event, which took place Jan. 19 in the B. Gale Wilson Elementary School, Fairfield. Johnson, active in the Roving Clovers 4-H Club, Dixon, judged the chili cookoff with Suzanne Cline of the Rio Vista 4-H Club, and Jestine Pinon of the Tremont 4-H Club, Dixon. All praised the flavor and the texture. 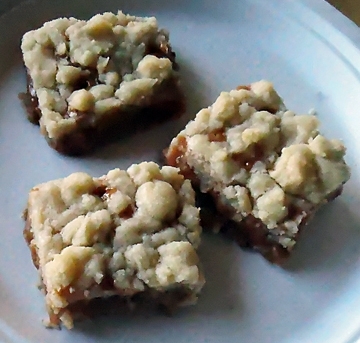 “It was just the right texture—not too thick and not too thin,” Pinon said. 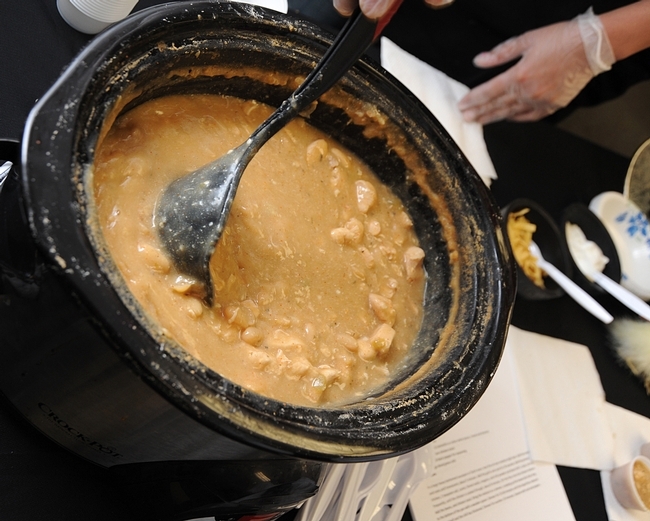 “And the flavor was really good,” Cline said. The winning chefs, self-described "Chili Birds," donned chicken-decorated baseball caps they’d made for the occasion. Afterwards, they confided "This is the only chili we'll eat." Their recipe requires eight minutes of preparation and is ready to eat in an hour and 15 minutes. So, total time from start to finish: one hour and 23 minutes. In a large heavy-bottomed saucepan or Dutch oven, heat the oil over medium-high heat. Add the onion and cook until translucent, about 5 minutes. Add the garlic and cook for 30 seconds. Add the ground chicken, 1 teaspoon salt, cumin, fennel seeds, oregano and chili powder and the diced chiles. Cook, stirring frequently, until the chicken is cooked through, about 8 minutes. Stir the flour into the chicken mixture. Add the beans and chicken stock. Bring the mixture to a simmer, scraping up the brown bits that cling to the bottom of the pan with a wooden spoon. Simmer for 55 to 60 minutes until the liquid has reduced by about half and the chili has thickened. Simmer for another 10 minutes. Season with salt and pepper, to taste. Other recipes showcased unusual ingredients. A team calling itself “Two and a Half Beans” from the Wolkskill 4-H Club, Dixon (Spencer and Riley Currey and Ricardo Setka), created a recipe, “Casablanca Chili,” which included sweet potatoes and chile-spiced mangoes. The Red Hot Chili Peppers of Suisun Valley 4-H Club (Kaylee Christianson, Olivia Frenkel and Tiffany Lum) added semi-sweet chocolate chips to their recipe, “Mexican Chocolate Chili,” while a group from the Wolfskill 4-H Club (Hannah Crawford-Stewart, Madeline Pitto, Katie Polik and Kiarra Ko-Madden) offered “The King’s Chili,” using some of Elvis Presley’s favorite foods—peanut butter and bananas. The Solano County 4-H Program is comprised of 400 youths. The clubs: Maine Prairie, Dixon Ridge, Roving Clovers, Tremont, and Wolfskill clubs, all of Dixon; Vaca Valley 4-H Club and Elmira 4-H Club, both of Vacaville; Westwind 4-H Club and Suisun Valley 4-H Club, both of Fairfield-Suisun; Sherwood Forest 4-H Club of Vallejo; and the Rio Vista 4-H Club of Rio Vista. More information about the Solano County 4-H Program is available from Valerie Williams, program representative, at vawilliams@ucdavis.edu or (707) 784-1319 or by accessing the Web site. To contact California’s statewide 4-H program, access http://www.ca4h.org/. The state's 4-H program is part of the UC Agriculture and Natural Resources. In 1909, Ventura schoolteacher Zilda M. Rogers wrote to the Agricultural Experiment Station at the University of California, Berkeley, then the flagship agricultural campus for California’s land grant institution, and a primary proponent and provider of garden education resources for schoolteachers. Rogers wrote in some detail about how her school garden work had progressed, what the successes and failures were, how the children were responding to the opportunity to garden, how her relationship with the children had changed as a result of the garden work, and what she saw as potential for the future. More than 100 years after Rogers wrote those words, school gardens have continued to be cherished in the public school system in which she worked. The Ventura Unified School District has developed a nationally recognized model that links school gardening, nutrition education and a farm-to-school lunch program featuring many locally sourced fruits and vegetables for its 17,000 public school students. School gardens had been used in parts of Europe as early as 1811, and mention of their value preceded that by nearly two centuries. Philosophers and educational reformers such as John Amos Comenius and Jean-Jacques Rousseau discussed the importance of nature in the education of children; Comenius mentioned gardens specifically. The use and purpose of school gardens was multifold; gardens provided a place where youth could learn natural sciences (including agriculture) and also acquire vocational skills. Indeed, the very multiplicity of uses and purposes for gardens made it difficult for gardening proponents to firmly anchor gardening in the educational framework and a school’s curriculum. It still does. The founder of the kindergarten movement, Friedrich Froebel, used gardens as an educational tool. Froebel was influenced by Swiss educational reformer Johann Pestalozzi, who saw a need for balance in education, a balance that incorporated “hands, heart, and head,” words and ideas that would be incorporated nearly two centuries later into the mission of the United States Department of Agriculture’s 4-H youth development program. (These words still guide the work of the University of California’s 4-H program). Educational leaders such as Liberty Hyde Bailey and John Dewey fused ideas of nature study and experiential education with gardening. Perhaps one of the earliest school garden programs in the United States was developed in 1891, at the George Putnam School in Roxbury, Mass. (Today, the nationally recognized food project also teaches youth about gardening and urban agriculture in the Roxbury neighborhood of Boston). Like others interested in gardening, Henry Lincoln Clapp, who was affiliated with the George Putnam School, traveled to Europe for inspiration. After traveling to Europe and visiting school gardens there, he partnered with the Massachusetts Horticultural Society to create the garden at Putnam; the model was replicated around the state. It was followed in relatively short order by other efforts, including a well-known garden program in New York City: the DeWitt Clinton Farm School. Gardening became nearly a national craze during the Gilded Age and Progressive Era and “school” gardens enjoyed immense popularity. 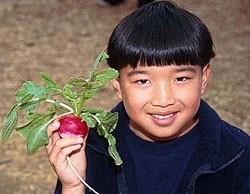 The United States Department of Agriculture estimated that there were more than 75,000 school gardens by 1906. As their popularity soared, advocates busily supplied a body of literature about school gardening and agricultural education. One book argued that school gardens were not a “new phase of education,” but rather, an “old one” that was gaining merit for its ability to accomplish a wide variety of needs. School gardens were a way to reconnect urbanized American youth with their agrarian, producer heritage, the Jeffersonian idea of the sturdy yeoman farmer. One author argued for the importance of gardening education and nature study for both urban and rural youth, for “sociological and economic” reasons. One important reason to garden with urban youth was to teach “children to become producers as well as consumers,” and for the possibility “of turning the tide of population toward the country, thus relieving the crowded conditions of the city.” Other reformers echoed this idea, including Jacob Riis, who said, “The children as well as the grown people were ‘inspired to greater industry and self-dependence.’ They faced about and looked away from the slum toward the country.” It’s now more than a century later, the average American farmer is in his/her late 50s, and the need to reconnect a new generation of youth to the land seems even more compelling. Could the school gardens of today provide the farmers of tomorrow? The school garden movement received a huge boost during World War I, when the Federal Bureau of Education introduced the United States School Garden Army. During the interwar years and the Great Depression, youth participated in relief gardening. During World War II, a second Victory Garden program swept the nation, but after that, school garden efforts became the exception, not the norm. 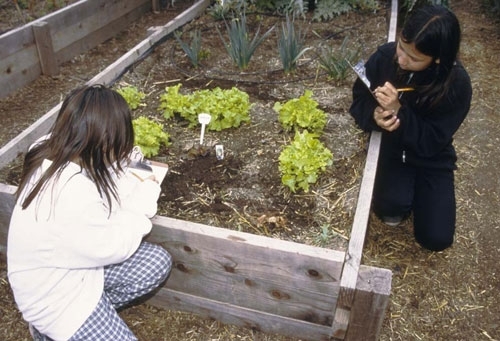 The 1970s environmental movement brought renewed interest to the idea of school and youth gardening, and another period of intense growth began in the early 1990s. Interest in farm-to-school has continued to breathe life into the school garden movement, and some states, notably California, have developed legislation to encourage school gardens. (Under the tenure of State Education superintendent Delaine Eastin, a Garden in Every School program was begun. Under Jack O’Connell’s tenure, Assembly Bill 1535, which funded school gardens, was approved). We should all take note of the tagline for the U.S. government’s youth gardening program in World War I: “A Garden for Every Child. Every Child in a Garden.” Wouldn’t this be a great idea today? With the cuts in school funding, increased classroom size and other challenges, some school garden programs are facing real challenges. They deserve our support, not only in practice (volunteer!) but also by our advocacy for public policies that support youth gardening work in school and community settings. Why not advocate for a nationally mandated curriculum that promotes food systems education in American public schools, something like “Race to the Crop”? Some of the best models for school gardens lie in our past. But the real potential of school gardens to reduce obesity, encourage a healthy lifestyle, reconnect youth with the food system and to build healthier, vibrant communities is something we can realize today . . . and is something that should be an important concern of our national public policy. A note to readers: Google Books contains copies of two important books in the school gardening literature of the Progressive Era, (Miller and Greene’s), as well as numerous other Progressive era books pertaining to gardening and agricultural education. To learn more about the United States School Garden Army’s efforts during WWI (a GREAT model for a national curriculum today! ), visit the UC Victory Grower website. Students record plant growth in a school garden. Spring is a big time of year for celebrating with a very cheap (cheep? 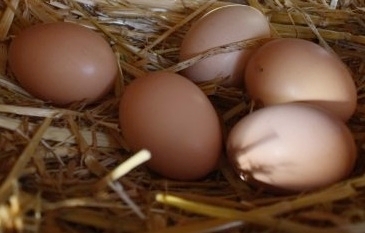 ), common, protein-rich food: the chicken egg. And because the hard-boiled egg has a special place at the Seder table and an important role in Easter morning hunts and afternoon picnics, eggs right now are selling like hotcakes. Problem is, the more eggs your market sells, the more likely you are to get them extra fresh, and consequently, the more trouble you're likely to have getting the things to peel when it's time to eat them up. Chemistry is at the root of the egg-peeling problem: a newly laid egg has a slightly lower, more acidic pH value than the raw egg that you've stored in the refrigerator for a few days. The higher pH of the stored egg allows its white to cling less firmly to the membrane just inside the shell once it is cooked, and less cling means you can get the shell off more cleanly and easily. If you managed to plan ahead and get your eggs five or more days ahead of time this year, good for you! If you didn't, well, better luck next time. Clean-peeling or not, they'll still taste great. There's a whole lot more to know about eggs than you might imagine—like whether you should wash eggs before you put them in the fridge (you shouldn't), what's the best way to store eggs in the fridge if you want them to last (pointy end down), and whether the refrigerator door egg rack was really such a great invention after all (it wasn't)—and a fun way to learn more is to visit a 4-H Avian Bowl competition at your local County Fair or other 4-H event. Thanks to the guidance and commitment of UC Extension Poultry Specialist Francine Bradley, California 4-H teams have been doing very well lately in the Avian Bowl, winning first place in the national competition in eight out of the last ten years. So next time you have a question about eggs or chickens, go find a 4-Her. Just don't ask them which came first. They get that a lot.